Peel and core 5 large quinces. Cover with water. Add 10 dried rosehips from the garden (after removing the stems and the dried sepals, and giving them a quick rinse). Boil/simmer for an hour. Mash the pulp once it is soft. Drain through a strainer into a bowl. Cover so no cat hair gets in the strainer (maybe that’s just my house). Use a nonreactive strainer like a jelly bag. The next morning, measure out how much juice you’ve gotten, and pour into a nonreactive pot. Add about half the same amount of sugar (i.e., 1/2 cup of sugar to 1 cup of juice) and the juice of one lemon. 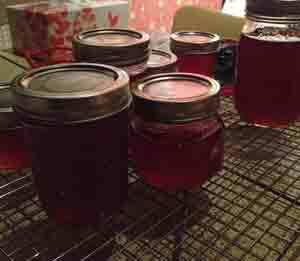 Watch carefully, and once it hits the jelly stage (I used a candy thermometer for this, as well as the cold spoon and dropping a little into cold water to see the pattern it makes) take it off the heat and put into prepared canning jars with sterilized lids. I have other fruit in the refrigerator, and I hope to make it into something useful later. You don’t have time to make dishcloths to go with chichi soap for the kitchen, especially when you’re stuck on the second sock for a family member (but it’s really not about me). But you still want to do something for that person in your life who lives to cook. Instead of going to that fancy chain at the mall, or that other one (we happen to have two), you might want to try shopping at one of the small, independent cooking stores. Choose cookbooks and accessories with a theme, like the Vedge cookbook, a mushroom-themed apron, a mushroom scrub brush, or a vegetable peeler, and you’re done. They don’t have much online. I’d check the store itself to see if there’s something your cook can’t do without (or never knew existed). The Gardener planted a lovely grapevine on the side of the porch. Rather than let all the grapes go, literally to the birds, we got busy. 11 cups of grapes = 3.5 cups of juice. 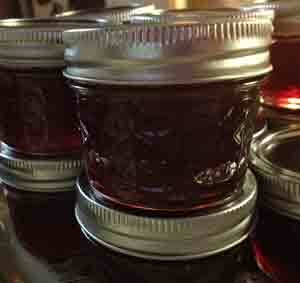 Add sugar, boil = 13 little 4 oz jelly jars, filled with jelly using the “no water” recipe in the Joy of Cooking. The kitchen’s a bit of a mess, though.